I look out the window as the bus drives down 7th avenue. Most of the small houses - built snug against each other - are only wobbly structures of loose bricks, corrugated iron, cardboard and wood. Less common are bigger houses built from bricks, most with patches of plastering crumbling from the walls. Windowpanes squeak on rusty limp hinges, the glass broken and curtains bubble through the holes. There are no gardens, just rocks and gravel scattered from the front doors all the way into the dusty street. Wire fences that enclose these structures are only about a metre in height, draped with tarnished clothing and linen. A sad heaviness roots in my chest as I wonder how these people could live like this. But when I notice the smiling faces of the elderly and the playful and laughing children on the street corners, I realise that all is not lost and the beauty of this place is to be found in its residents. “Past and present are integrated in Alexandria Township,” explains Anton Shaw, our tour guide. “It has a multi-ethnic African urban buzz. It’s not just a place, but an experience of its people where you can plug in and play, where anything can happen. 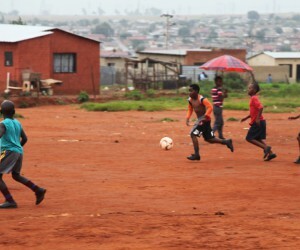 A more prominent rags and riches contrast you won’t find anywhere in Gauteng. Alex might be grimy, noisy and rife with gangsterism but she has a proud anti-Apartheid history and a jazzy atmosphere that no amount of neon can emulate”. I look at the brochure in my hands, and read the inscriptions: Alexandria was proclaimed as a township in 1905 and soon blossomed into a bustling community. In the 1960's it was one of the few places where black people could own property, and eventually the Apartheid government decided to exert greater control over it, considered the area ‘a hot bed’ of resistance. The government decided to remove the residents and replace their houses with hostels for migrant workers. After years of protest by residents, the decision was reversed and Alexandria (unlike Sophiatown) has survived. Jazz melodies come flowing from inside the building. From the pavement in front of a shebeen, poetry is recited by a 12-year old, wishing to follow in the footsteps of the pioneers. The scrawny boy, dressed in a Bafana-Bafana t-shirt, stands proud, reciting a poem by Ben Mhlongo, an Alexandria resident, poet and cultural activist that was published in ‘Down Memory Lane is Chandies’. I get up, walk to the boy and stuff a R20 note into his fist. He smiles, “Thanks sister”, I return his smile, nod my head, and walk into the shebeen. 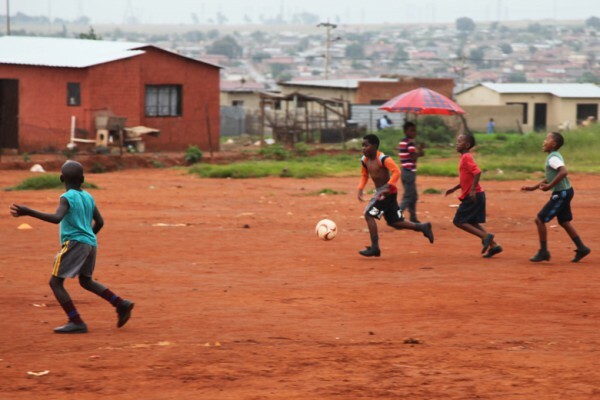 In Alexandra the past is forgotten and there is much more hope for the future. Even still amongst dire adversity, Alex’s people are smiling, laughing, and living a life filled with art, poetry, music, humour and the profound joy of simply being alive.